You can mix canned tuna with some dressing and vegetables to make a quick and easy tuna salad. Enjoyed with some whole wheat crackers or over a bed of salad greens, tuna salad can make for a healthy meal or snack. However, for people battling hypertension, or high blood pressure, canned tuna can present its own challenges. Called tuna tends to be high in sodium, which can elevate blood pressure. Taking a few extra moments when preparing your canned tuna can greatly reduce its sodium content and may make it suitable to eat occasionally for people with hypertension. Consult your physician if you suffer from hypertension to determine if canned tuna is suitable for your diet. Open the can of tuna and scoop the tuna into a strainer. Both water-packed and oil-packed tuna contain the same amount of sodium. However, water-packed sodium contains less fat than oil-packed and is often a better choice for overall nutrition. Additionally, no sodium difference is noted between white and light tuna. Rinse the tuna thoroughly. The water will rinse off much of the salt that was used to preserve the tuna. Transfer the tuna to a plate and pat it dry with a paper towel to prepare it for use. Prepare and eat your tuna. Avoid sodium-rich sauces and spices, including mayonnaise and pickle relish, which can 105 mg of sodium and 122 mg of sodium per tablespoon respectively. Instead, opt for low-sodium flavorings, such as olive oil and vinegar, which contain no sodium. 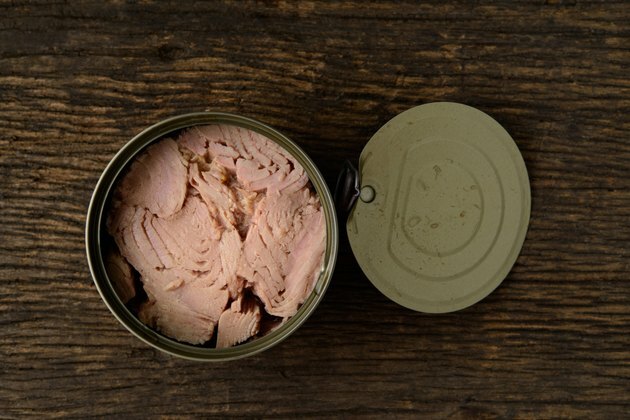 Is Tuna Healthy to Eat?